Home » Assistant Professor » LIBRARIAN » Maharashtra » Mumbai » STATE GOVT. JOBS » Teaching » M.K.E.S. 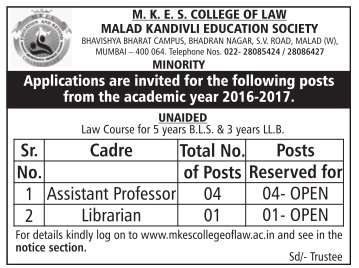 Law College Assistant Professor and Librarian Posts Recruitment-2016. M.K.E.S. Law College Assistant Professor and Librarian Posts Recruitment-2016. Last Date to Apply: 30 Days from the date of Advt.